How To Use Oat Flour is #11 in my monthly blog post series on gluten free flour. This is the final flour I will write about. Not forever, but just for now. Next month I will complete this year-long series by writing about gluten free flour mixes. This idea for a blog post series on How To Use Gluten Free Flour started when I wanted to create a downloadable chart with tips for using different flours. I had a cupboard full of flours but didn’t really have a good idea of which ones to use for what recipes. I’ve worked my way through all the flours and starches in my cupboard and learned a lot. The next step is more cooking using these flours in some of my tried-and-true recipes. Oat flour is finely ground from whole oats. A simple, healthy choice one would think. But what about the biggest challenge of eating gluten free; cross contamination. For anyone new to gluten free, manufacturing is a complex process with lots of opportunity for cross contamination. Montana Gluten Free gives a nice explanation of the steps they take to ensure their oats are safe…from Farm to Fork as they say. They use a Purity Protocol and this is the only way to guarantee the oats are safe for anyone on a gluten free diet. Tricia over at Gluten Free Watchdog shares accurate up-to-date information on all gluten free food products and claims. Oats and oat products is a popular topic for her. I recommend you follow her wherever you follow people. I think it is safe to say that the future is sure to continue to provide improved labelling and increased confidence for consumers of gluten free products. Thanks to Gluten Free Watchdog for sharing this information. There is a more extensive list of companies selling oat products but these companies actually sell oat flour. Of course they are all made from purity protocol oats so I like to support them with my shopping dollars. High in fiber which is important for anyone on a gluten free diet. Light texture and mild flavour similar to wheat. Absorbency that adds moisture to baked goods. Helps make cakes light and fluffy. Oat flour labeled gluten free may still contain gluten greater than 20 parts per million. Support manufacturers that use purity protocol oats. Use up to 25% oat flour in a gluten free flour blend. Pancakes, muffins, brownies and cupcakes. Oatmeal cookies, it gives a thick and chewy texture to them. Use to prevent bread dough from sticking. My Potato Latkes call for oats but many latke recipes use flour. Try using 2 tablespoons oat flour in any recipe for latkes or potato cakes. Many fruit crisp recipes including my Rhubarb Strawberry Crisp, use flour and whole oats in the crumble topping. Try replacing half the flour mix with oat flour. The streusel topping on my Cranberry Orange Muffins calls for 2 tablespoons of a few different flours. 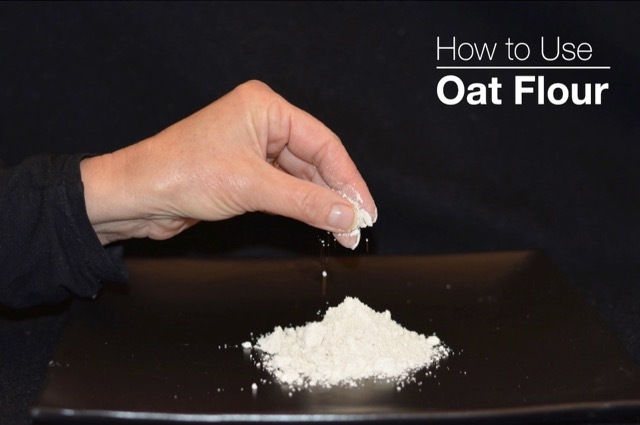 Try oat flour to add a little fibre to your baking. Like many muffin recipes it also calls for 2 cups of gluten free flour mix so try substituting ½ cup (25%) with oat flour. Substitute anywhere from ¼ cup to ½ cup of oat flour for the flour mix in any pancake or waffles recipe. In this recipe for Banana Muffins substitute anywhere from 2 Tbsp to ⅓ cup of oat flour for the total amount of flour mix. Cookies are a little more finicky so I would only substitute a small amount of the gluten free flour mix with oat flour. Try using ¼ cup or ⅓ cup of oat flour in a recipe like either of these Chocolate Chip Cookies or Chocolate Chip Cookies with Teff. I’m sure it would be excellent in an oatmeal cookie too. Oat flour might be perfect in a recipe like granola bars. My recipe calls for brown rice flour but I’m going to try oat flour next time I make them. This is a series of blog posts on gluten free flours. My intention is to provide a basic overview of several gluten free flours for the everyday home cook, both new and experienced. Let me know in the comments below if you have a specific problem with your baking or a tip you’d like to share.